FORS Practitioner workshops are now available to book for April, May and June 2018 in locations across the UK. FORS Practitioner is a series of 10 workshops which, together, cover all aspects of fleet management. 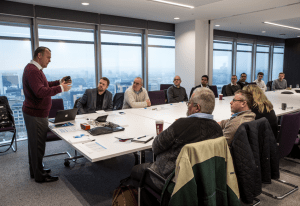 Completion of all 10 workshops will mean you join an elite group of 900-plus FORS Practitioners – all fully conversant with the skills to excel in modern fleet management. Please click here to access the list of Practitioner workshop dates and locations from now to the end of June 2018. Dates from July onwards will be released in due course. Under ‘D4 Professional development’ of the FORS Standard, fleet operators are required to identify and document the training needs of drivers and other staff involved in the fleet operation, as well as to implement a Professional Development Plan (PDP). FORS Practitioner is a recommended professional development programme for all managers, trainers and supervisory staff. Though attendance at the workshops is not mandatory to meet requirement ‘D4 Professional development’, it should be considered for inclusion in the PDP for relevant staff. The recent introduction of the workshop ‘Managing noise in logistics’ does not affect the status of current FORS Practitioners, however current FORS Practitioners are encouraged to attend this latest workshop. We appreciate that plans do change, but, as these workshops are very popular, please advise us as soon as possible if you need to cancel your place/s. Please refer to the FORS workshops cancellation policy for information prior to cancelling your place/s.